The F3 desk arrived at the Kent track which was bathed in sunshine for qualifying and conditions were spot on for it. After a hearty breakfast, we settled in for a cracking session. Setting better lap time after lap time, the Carlin driver was always in control, with the eventual margin being just 0.062 seconds from team mate Nicolai Kjaergaard, who squeezed his fastest lap in with minutes to spare. Red flags came out as Caroline decided to get a closer look at the pit wall… Danish ace Kjaergaard’s final lap just pipped Billy Monger to the front row spot by just 0.011 seconds, with Carlin taking an impressive 1-2-3 in qualifying. Championship leader Linus Lundqvist was also in the mix, but a slightly off-colour performance only resulted in being fourth quickest – giving the Swede all to do in the afternoon. Sun Yue Yang posted the fifth fastest time, 0.020 seconds ahead of Lanan Racing’s Kush Maini, who was sixth quickest. Krishnaraaj Mahadik took seventh for Double R Racing, with Brit Tom Gamble and Manuel Maldonado eighth and ninth for Fortec Motorsports. Sasakorn Chaimongkol saw out the top-10 for Hillspeed. Monger did take over at the top all but momentarily and the excitement in the crowd was palpable. Not to be outdone, Lundqvist also joined the party with the top three covered by just 0.046 seconds at this stage. Caroline then reclaimed the top spot with a 1m21.637s. Kjaergaard, who was improving all the time, was just a little late to the party and had to settled for P2. Red flags courtesy of Caroline ensured that that’s how the times stayed. Despite a small delay in coming out for qualifying, the Danish ace confirmed they were just waiting as the team thought the track would offer the best late in the session. As the heat rose, the afternoon arrived and so did race one and Caroline took his pole and turned it into a race win. A great first lap – and in only his second race in F3! – Caroline headed home championship leader Linus Lundqvist. The Swede gained two positions off the line to claim second and therefore extended his championship lead over Nicolai Kjaergaard, the Dane claiming third. Local lad Monger took fourth place ahead of Carlin team mate Sun Yue Yang in fifth. Maini claimed sixth for Lanan Racing ahead of Double R Racing’s Mahadik, with Maldonado eighth for Fortec Motorsports. Tom Gamble and Sasakorn Chaimongkol saw out the top-10. A star almost as strong as the sunshine, Caroline held a lead of almost two seconds after the first lap, while Lundqvist starting fourth picked off both Monger and Kjaergaard on the run to Paddock Hill to hold second place. The ever-present Carlins of Monger and Kjaergaard meant Lundqvist had his eye on his mirrors and allowed Caroline to build his sizeable lead in front. However, in the second half of the race, Lundqvist – on older tyres than the Carlin cars – was still able to use his grip, setting a number of fast laps and eating away at the lead. Kjaergaard was always close behind though, and ended the race with the fastest lap, setting up a possible pole for race three on Sunday afternoon. Monger came in fourth and was right amongst it in the opening laps but faded slightly as the race went on. He defended heavily from team mate Sun Yue Yang, with the Chinese driver just 0.374 seconds behind at the chequered flag. Maini in sixth was nearly six seconds behind at the end of the race, but comfortably clear of Mahadik, who had Maldonado fin his lap for much of the session, the Venezuelan driver surviving a trip of the racing line exiting Graham Hill Bend on lap one. 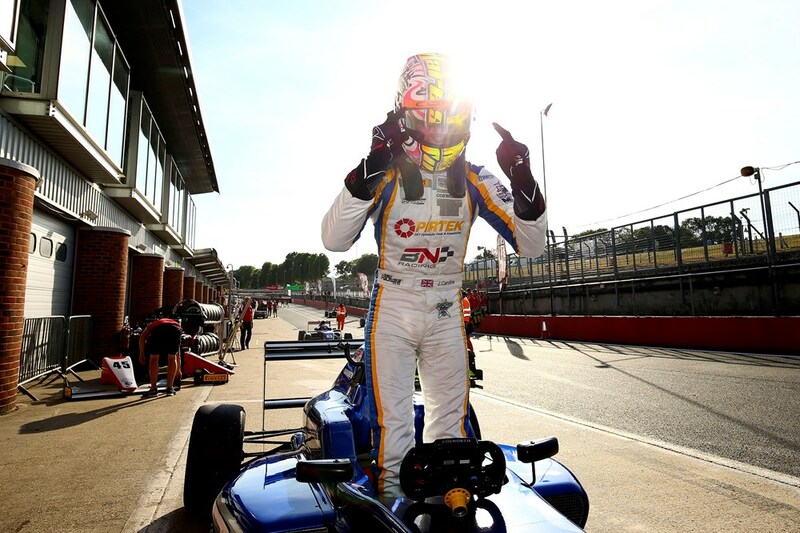 Gamble, down a place on his grid position claimed ninth on his first visit to the Brands Hatch Grand Prix circuit in a single seater, and finished well clear of Chaimongkol, who was busy exchanging blows with team mate Jusuf Owega for the final spot in the top-10. On his second win, Caroline said: “It’s pretty good to get my second win in three races. The car was mega, it didn’t fall off at all throughout the race and it was faultless – like it’s been all weekend. I knew, therefore, that it was all down to me which adds a bit of pressure knowing it’s all down to the driver. “The start wasn’t great, so I was mirror-watching at the start. It was a terrible start and possibly the worst I’ve ever had and worse than some of my practice ones I think! But we got plenty of heat into the tyres in the first few laps and I was able to push like I did in qualifying straight from the off and managed to get a gap. From there it was a case of trying to maintain the gap, minimising mistakes and things like that.